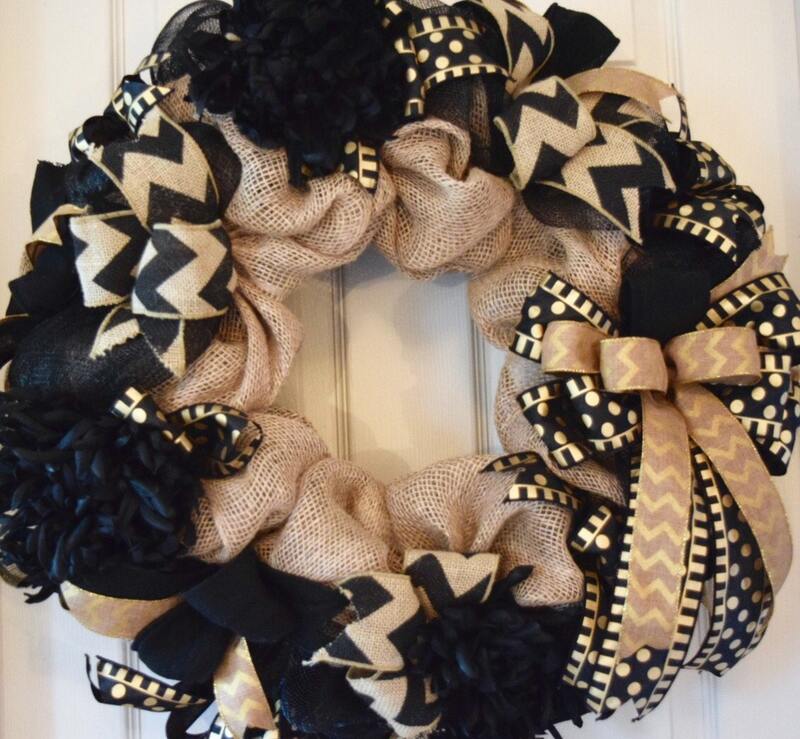 This is a gorgeous, shimmery burlap wreath, perfect to display in your home all year long! It is crafted with a poly burlap mesh and a black poly mesh. 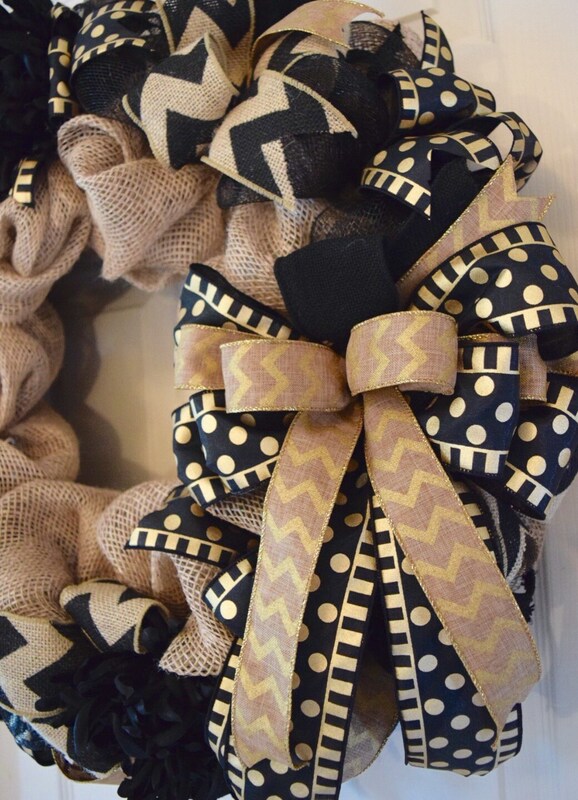 An abundance of bows encircle the entire wreath. 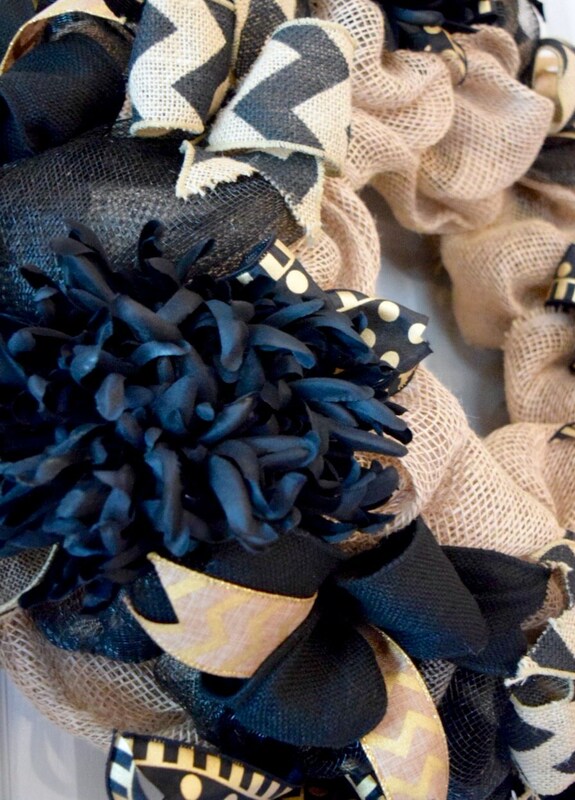 The ribbons used include a sand/gold chevron, a black burlap, a satin black/gold with stripes and dots, and a burlap/black chevron. A large bow hangs to the side. Three large black spider mums are tucked within the bows to add the finishing touches. Because my wreaths are handcrafted, no two are exactly the same. Your wreath may differ slightly from the one pictured. ***THE BLACK SPIDER MUMS CAME WITH A TAG THAT READS, "The color may transfer. Do not put in contact with a light surface." I will spray with an acrylic sealer, but I cannot guarantee that there will not be any transfer of color. I RECOMMEND THAT THIS WREATH BE DISPLAYED INDOORS ONLY TO PREVENT ANY EXPOSURE TO MOISTURE (WHICH IS LIKELY TO CAUSE COLOR TRANSFER). The wreath measures approximately 24" in diameter and 8" deep. Please note that my wreaths are not intended to be displayed directly in sunlight or directly exposed to weather elements. It is preferred that they are displayed indoors or under a covering, such as a porch. If displaying outdoors, I highly recommend applying a UV protector spray (available at craft supply stores). This will provide some protection from fading and moisture damage. Reapply as needed. Due to variations in screen settings, the colors that appear on your screen may vary. I will do my best to describe the colors in my descriptions. If you have any questions or concerns, please contact me prior to completing your purchase. Measurements of wreaths are taken from the outermost edge of the wreath and are only approximations. If you have size constraints, please contact me prior to completing your purchase for more exact measurements. 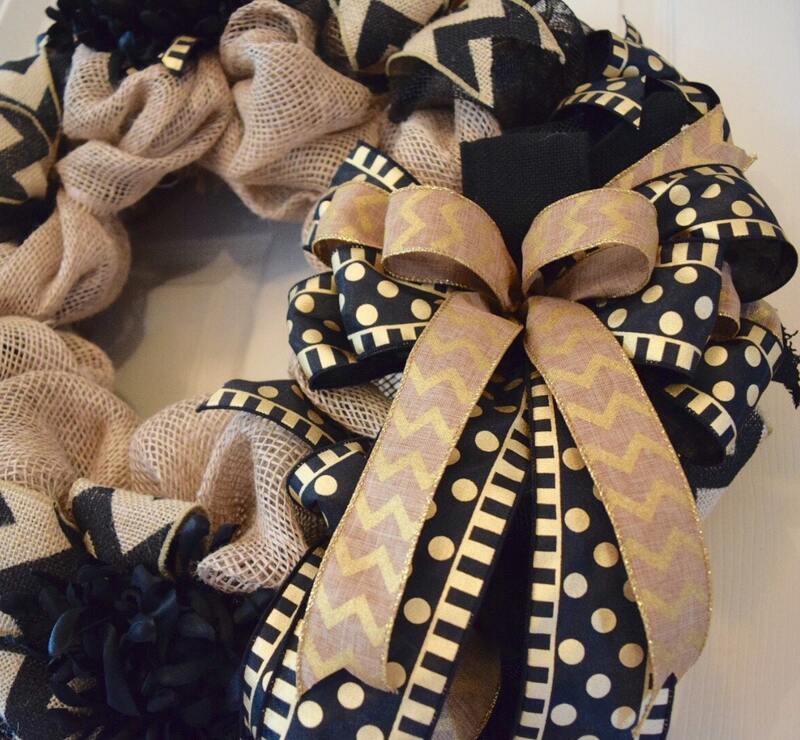 Because my wreaths are handmade, no two are exactly the same. Your wreath may differ slightly from the one pictured. 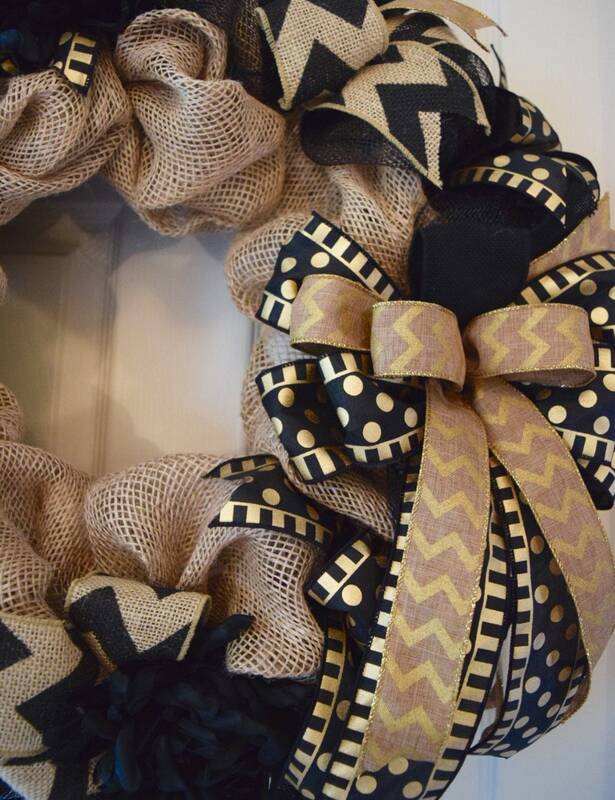 I spend a great deal of time to ensure that your wreath is packaged securely to minimize the risk of damage. During transit, your wreath will flatten. 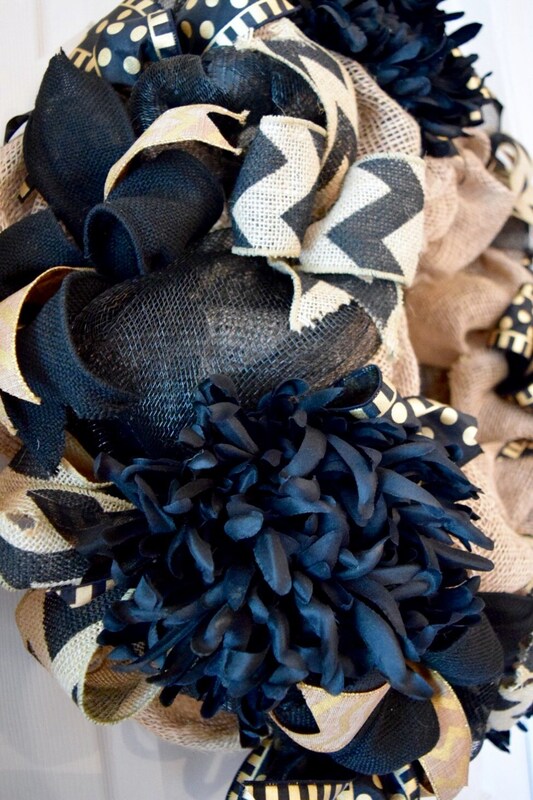 It will be necessary to "fluff" the ribbons and bows (give them a smooth appearance) upon arrival. If you are uncertain on how to do this, please contact me and I will be happy to walk you through it.